I’m currently designing a new theme aimed at those who are passionate about cooking, food and all things kitchen related. I quite enjoy spending time in the kitchen – I don’t claim to be any good at cooking – have had some culinary disasters in my time – however am slowly improving. It’ll be a while before it’s ready – it’s still at the very early stages of design. 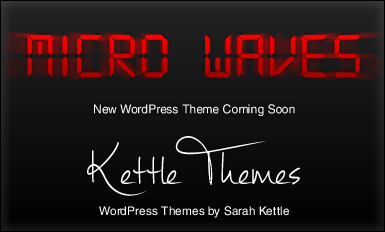 The working title thus far is microwaves – as suggested by my 6 yr old niece! This will probably change – although I do like the digital style font, and admittedly I use mine a lot. Hopefully my theme will end up being as popular, versatile and easy to use amongst users!